They've all got it in f' me...."
It's been said that the role of the villain is always preferred by the actors over that of the hero. And who can blame them? It's more fun to play; there are no holds placed on how far over the top they go with the emoting; and usually they have the best costumes. 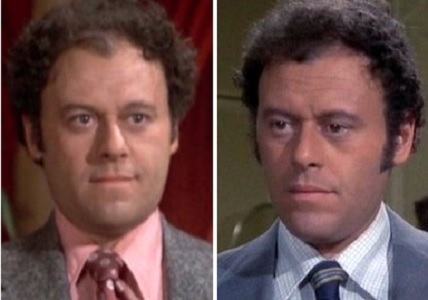 The villains are great and that's why Classic TV Villains are being celebrated throughout the Classic TV Blog Association this weekend. If you click on the CTVBA's button there to the left, you'll find the hyperlinks for all of the other blogs participating over these two days. Like other Gallifreyans - for example The Master, The Rani, The Corsair, and of course, The Doctor (who may or may not be also The Curator) - The Monk is known by that appellation rather than by his birth name. He has been identified as "Mortimus" and I rather like that even if it does come from the audio plays. That description of the Monk as an old friend of the Doctor's is a good example of why I would rather disregard most of the information gleaned from sources outside the TV show. 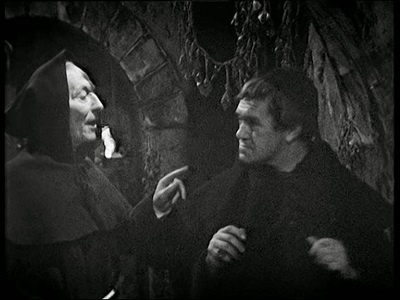 In "The Time Meddler", the Doctor didn't know him, although apparently the Monk recognized him. And the Doctor assumed that the Monk was from fifty years into his Future. As I said earlier, for the most part I don't want to take into consideration information about the Monk from the novelizations, the audio plays, or the illustrated stories. But on occasion there is some trivial tidbit that does spark my interest. But there's just something about that name that I like. I'm a big believer that names should fit the person who bears it. (Try switching the names of Laurence Olivier and Buddy Hackett. It's just wrong!) 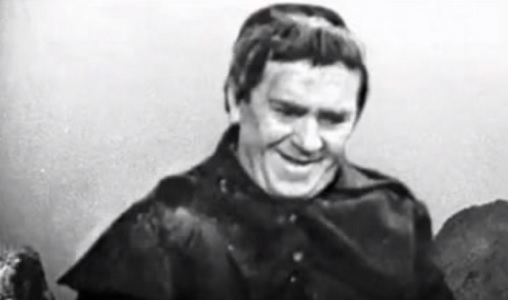 And "Mortimus" looks and feels like the perfect name for a monk played by Peter Butterworth. However, just to be on the safe side, in case another writer comes along to revise his character, I'll accept "Mortimus" as an alias used by the Monk in much the same way as the Doctor uses the name John Smith while on Earth or when he sported the nickname "Theta Sigma" while he was at the Prydonian Academy. 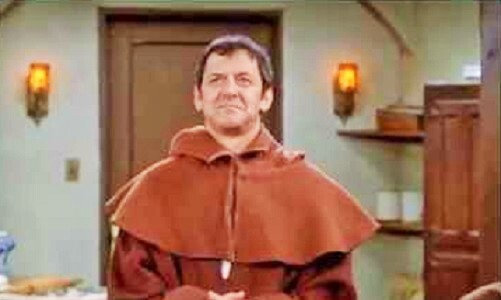 The Monk is a fictional character in the British science fiction television series 'Doctor Who'. 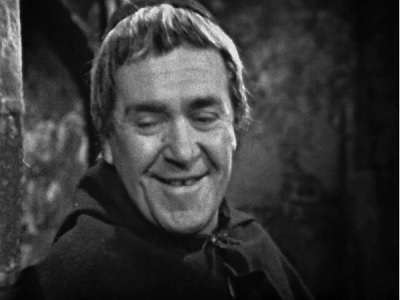 Played by the British actor Peter Butterworth, the character appeared in two stories, "The Time Meddler" and "The Daleks' Master Plan', as an adversary of the First Doctor. They were written and co-written respectively by Dennis Spooner. 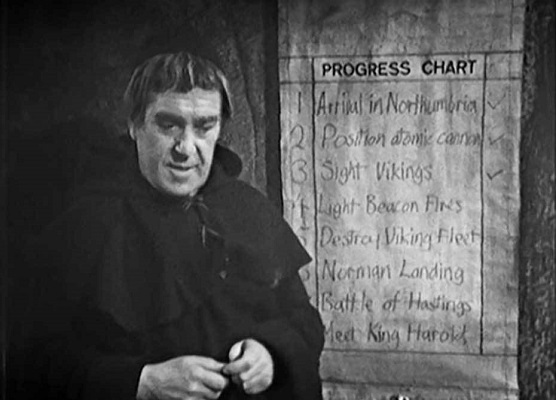 Other than the Doctor and Susan, the Monk was the first member of the Doctor's race to appear in the program, and the second Doctor Who villain (after the Daleks) to make a return appearance. 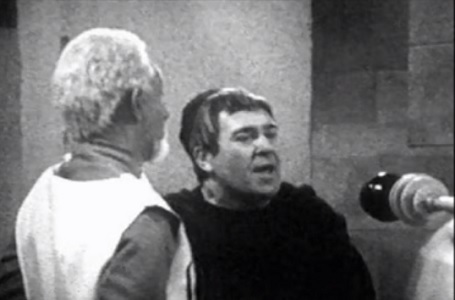 The Monk was the possessor of a stolen Mark IV TARDIS – superior to the Doctor's and with a fully functioning Chameleon Circuit. The Doctor hypothesized that the Monk left the Doctor's then-unnamed home planet, Gallifrey, some 50 years after the Doctor did. 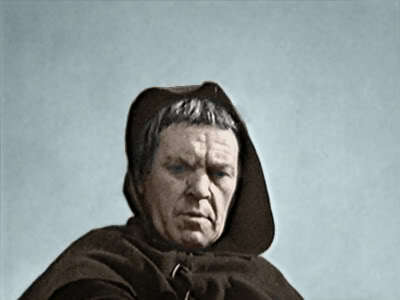 The Monk liked to meddle in history and to change it for his own amusement and for what he considered to be the better: lending mechanical assistance to the builders of Stonehenge; giving Leonardo da Vinci tips on aircraft design; making money by using time travel to exploit compound interest; and, when the Doctor first encountered him, attempting to prevent the Norman Conquest as part of a plan to guide England into an early age of technological prosperity. On that occasion he wore the guise of a monk in order to gain the trust of the 11th-century locals of Northumbria, hence the name by which he became known. 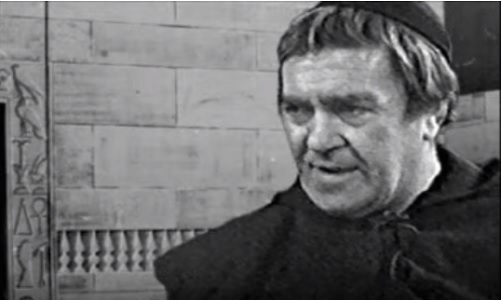 The Monk, as played by the late Peter Butterworth, only appeared in two stories as far as the television series was concerned and hasn't been seen on our TV screens since January of 1966. He has returned several times since in other metafictional universes like BookWorld, the Audioverse, and the land of comics. But I'm a televisiologist. It's rather a purified viewpoint but I prefer to deal only with the TV Universe. TV Land to some, Toobworld (Earth Prime-Time) for me. So for the most part I'm not going to bring those outside stories into play. The Doctor, Vicki, and new companion Steven Taylor arrive in Saxon Northumbria on the eve of the Viking and Norman invasions. It is 1066, a pivotal moment in British history. The hand of a mysterious Monk is at work in the nearby monastery, intending that history takes a different course. Based on this picture, the Monk had a multi-step plan to alter history, in order to avoid the time wasted on Mankind’s advancement during the Dark Ages. 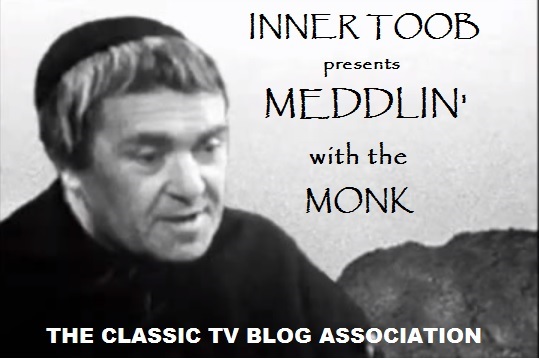 In my opinion, bringing back the Monk on a recurring basis would have been the best way to keep faith with Sidney Newman's original vision of using the show to teach kids about History. What better way than to show what the historical facts were if you didn't also show how wrong the timeline could have turned out? The Monk has not been seen in Toobworld for over a half century and I would doubt that he was stuck on that icy world (perhaps the Oodsphere? Or - this being the interconnected TV Universe - Aracta from 'Battlestar Galactica' - "Gun On Ice Planet Zero"?) since then. 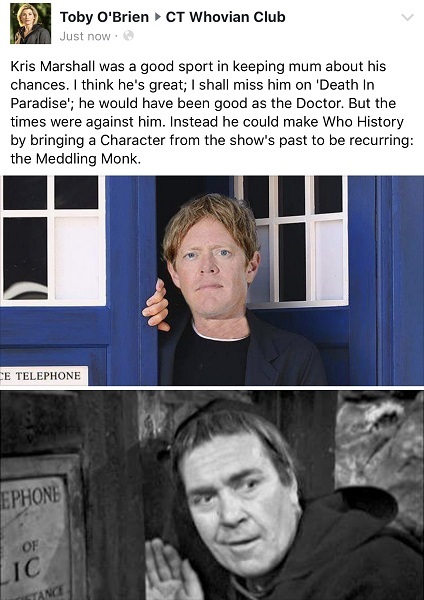 The role would have to be recast, using the Gallifreyan "Get Out Of Jail Free" card of regeneration, since Peter Butterworth passed away in January of 1979. The show has seen other characters, usually entire species, revived and revised since its return in 2005 - from the devolved Macra to a more believable and detailed look at the Silurian, as well as the return of Rassilon and lovingly, Sarah Jane Smith, with an interesting twist to the sage of the Master. It's about time that the Monk was given such consideration as well, since I think he could serve an important function within the framework of the 'Doctor Who' timeline. Over the course of the show's history, there have been plenty of plot holes, revisions, and those discrepancies which I call "Zonks". And to make it all tidy, we could claim that it's because of interference by the Monk that these Zonks occurred. Those two stories in which the Monk appeared would probably have been the template for future jousts with the Doctor – the Monk would have altered the Terran timeline but the Doctor would derail his plans and “make right what once went wrong”. But it wouldn’t be exactly the same as it once was. It would be like putting together IKEA furniture – little bits would still be left over from that earlier revised timeline. 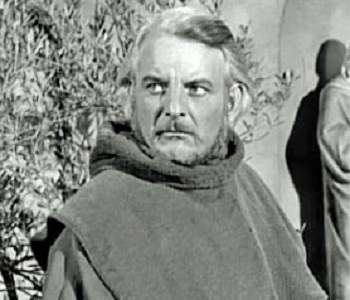 Throughout his appearances, the Monk has generally come across as a 'wannabe' rather than a true villain or hero, with his greater plans and objectives fundamentally undermined by his own inability to recognize his limitations, such as participating in an alliance with the Daleks to conquer Earth because he believed that the Daleks would be defeated eventually. For all of his grand schemes, there would only be tidbits, scraps of a new timeline remaining to mark that he had tried to make a difference, for good or ill, for the greater good or his own benefit. 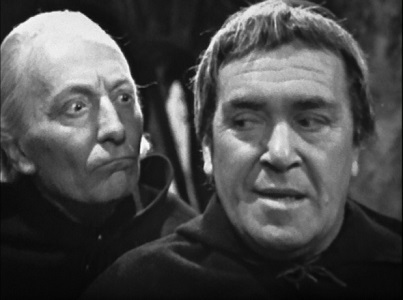 And that’s when we can call upon the meddling Monk as the reason those discrepancies could be found in ‘Doctor Who’. For example: K-9 was left on Gallifrey with Leela, yet when we saw the tin dog again, he was now with Sarah Jane Smith. But if you know me, then you know I wouldn’t be satisfied with just using the Monk to clean up production slip-ups in just ‘Doctor Who’ alone. I consider myself one of the curators of the shared TV Universe and there have been so many Zonks over the years which needed some “splainin to do”. Nothing major, nothing radical, mostly trivial – befitting a “wannabe” like the Monk. Like I said, it could be something trivial in the grand scheme of things – a change in a character from one episode to the next, perhaps as simple a change as the character’s name. 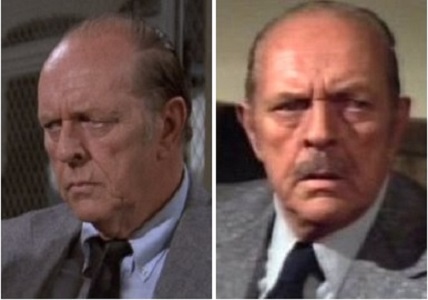 When we first meet the bumbling yet eager police detective in “The Greenhouse Jungle”, his full name was Frederic Wilson. However, when we met him again in a later episode (“Now You See Him”), the Sergeant was now known as John J. Wilson. This could be a case in which there was a baby in the Sampson family who grew up to be a police captain. Now the same could hold true in the revised timeline. However, now the Sampsons had broken up and Mrs. Sampson took her child to be raised by her second husband, who adopted him and gave him the last name of August. Aside from the name change, I would guess his life played out as it did in the previous timeline. As you can see, those are trivial changes, making them perfect to be the sad legacy of the Monk… as things stand now. Certainly those aren’t temporal alterations on the scale achieved by Helen Cutter of 'Primeval', who reshaped American History for one thing, besides causing thousands of recastaways - like the woman who employed ‘Phyllis’ in San Francisco, Julie Erskine, and the fathers of Jerry ‘Seinfeld’ and George Costanza. But still he could have had a more powerful impact on the TV World than we are aware of from viewing it from the outside looking in. 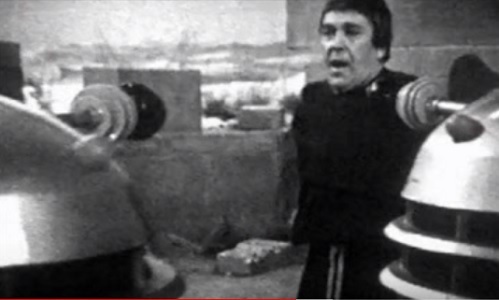 Remember, the Monk only had two adventures sparring with the Doctor… that we saw. Within the “reality” of the ‘Doctor Who’ universe, think of all the other times he caused havoc and what might have been altered. 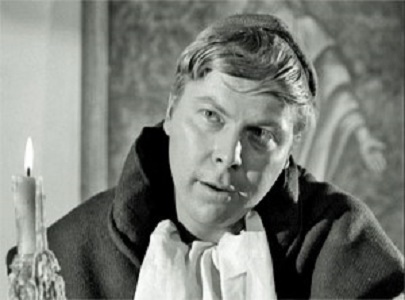 This is the Time Lord who helped in the construction of Stonehenge using an anti-gravitational lift. He has all of Time and Space at his beck and call to help him rewrite our past. He's not one to be taken lightly! 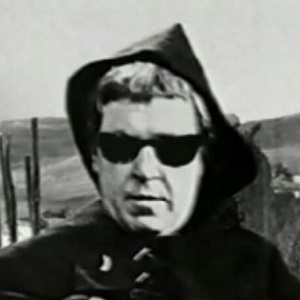 In his Peter Butterworth persona, perhaps his first incarnation, maybe he was a let-down as a villain. But bring him back, regenerated into a new actor (or actress.) Let’s see what chaos he could pull off in his next lifetime! Just a side note: Last year I ran a "What If?" post about what the regenerations of the Doctor would have looked like had the US TV networks ripped off the 'Doctor Who' concept. So let's take it a step further. What would the Monk have looked like if he had been part of an Americanized 'Doctor Who'? And what if he had been in for more than just two stories, regenerating along the way? 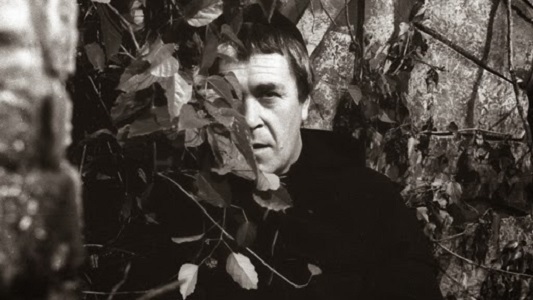 Next year, besides being the 40th anniversary of Peter Butterworth’s passing, it also marks his centenary on February 4th. I think I could come up with a theoretical argument based on this post for the Monk’s inclusion in the TVXOHOF to celebrate. * The header quote is attributed to Kenneth Williams as Julius Caesar in "Carry On Cleo", but it was Danny Kaye's utterance which first brought it to my attention. And besides that, my source is from the greater Toobworld Dynamic and not the Cineverse. (According to the IMDb, the movie got it from Jimmy Edwards' radio show "Take It From Here".) 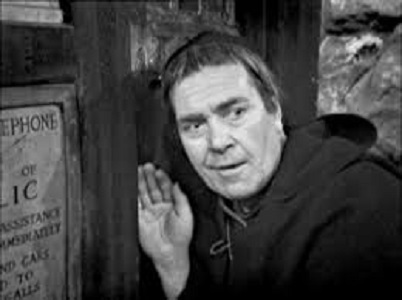 But it's also an apt quote since Peter Butterworth who played the Monk could also be found in the "Carry On" franchise. Thanks, Rick; glad you enjoyed it! 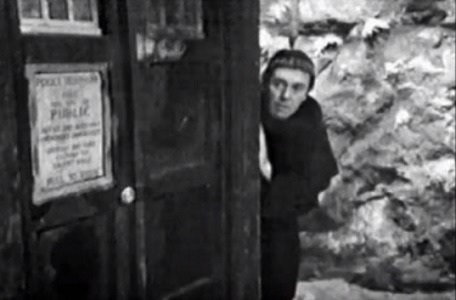 I haven't seen the classic Doctor Who installments with The Monk either--but boy, it would be fun to see him brought to life in the contemporary series. I love all the references in the new WHO to the classic series. Maybe even a Christmas episode? Thanks for joining the villain blogathon. Love what you've done with this! 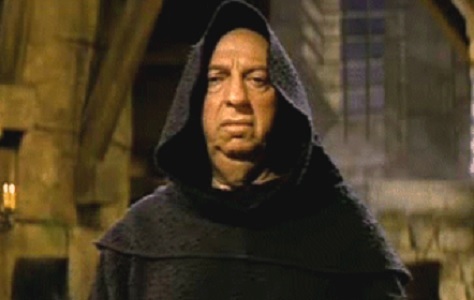 As I've mentioned in other pieces, I came to Doctor Who via our local PBS station, somewhere in the middle of the Tom Baker run, and as a result I'd read a lot about The Meddling Monk before I ever got a chance to see him. It was worth the wait! Terrific piece, and I agree with you that it could have been very interesting (and true to Newman's vision) had he made more appearances. Well, well...yet another reason why I have to take a year off to watch Dr. Who. I've yet to see a single episode and have hopes to watch from the very beginning. Both entries dedicated to the show in this year's blogathon have whet my appetite...and then your Columbo mentions stole my heart. Great entry!! VIDEO SATURDAY - "EAST HOLLYWOOD SQUARES"